Around the world, persons with disabilities face immense challenges to exercising their political and human rights, particularly in new and emerging democracies like Myanmar. According to the country’s 2014 census, 2.3 million Myanmar citizens have a disability, but the World Health Organization and many international experts estimate that figure to be significantly higher. 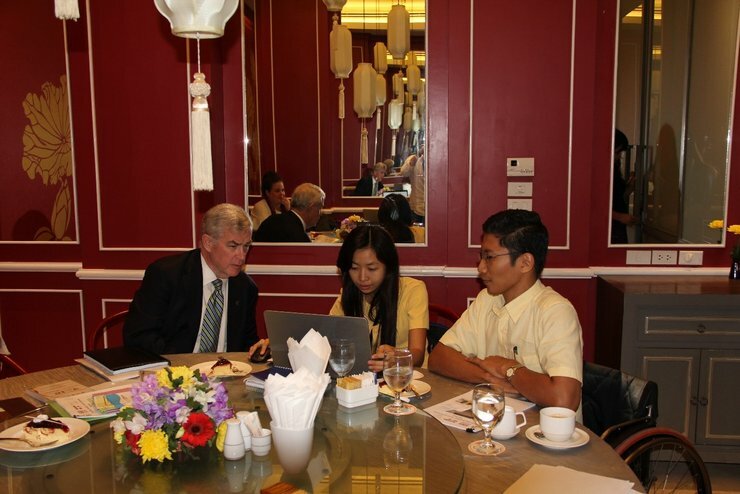 As Myanmar prepared for its historic 2015 general elections, I spoke with Nay Lin Soe, the articulate Program Director for the Myanmar Independent Living Initiative (MILI), to discuss the barriers encountered by persons with disabilities, the remarkable advances that have been achieved for persons with disabilities in Myanmar in the last five years, and MILI’s work in the lead up to Myanmar’s historic 2015 elections. MILI was established in 2011 by leaders with disabilities who believed that Myanmar citizens with disabilities needed an organization to advocate for the rights of all persons with disabilities. Prior to the founding of MILI, Soe noted, disabled person’s organizations (DPOs) in Myanmar tended to focus on issues related to one specific type of disability. Several leaders from the disability community – including Soe, who is a wheelchair user – recognized this gap and founded MILI. At its inception, Soe passionately noted, “MILI had no budget, no resources, all we had was a 100 percent commitment to make the organization stronger so we could advocate for the rights of persons with disabilities.” Four years later, MILI has 45 full-time staff and nine part-time staff. In 2011, MILI had one office in Yangon, the country’s bustling, largest city and commercial capital. Today, MILI has 21 offices across the country. This is critical for many of the persons with disabilities who live in remote, difficult to access regions across Myanmar, as most DPOs are based in and focus on Yangon. Unlike in many countries in Southeast Asia, advocacy for persons with disabilities in Myanmar was relatively limited back in 2011. Soe attributed this to a dearth of leaders with disabilities in the country and MILI has sought to address this gap by focusing on capacity building for these leaders and working to strengthen DPO networks in Myanmar. Moreover, MILI has interfaced with other DPOs in member countries of the Association of Southeast Asian Nations (ASEAN) through the International Foundation for Electoral Systems (IFES) supported ASEAN General Election Network for Disability Access (AGENDA). MILI has actively sought collaborations with media in Myanmar, inking agreements with radio stations to broadcast voter education programs free of charge. Soe also said that there are very limited resources in local languages for persons with disabilities, so MILI publishes a magazine in Burmese. In 2013, MILI organized Myanmar’s first national art festival for persons with disabilities and continues to do so annually. MILI uses this forum as a tool to educate the public about the rights of persons with disabilities. Five times a year, MILI organizes two-day workshops for stakeholders around Myanmar – including government officials, media, and business and religious leaders – to explain how disability rights are not a medical or charity issue. “We tell these stakeholders that disability rights are a societal rights-based issue that is important for democracy,” Soe explained. More and more, “DPOs are stepping up and speaking out on issues related to disability rights,” Soe said. Myanmar’s Union Election Commission (UEC) is one partner that Soe singled out for being particularly receptive to DPOs’ messages. “Because of our [DPOs] collective effort, election by-laws and procedures have changed to provide more accessible elections. The UEC is very friendly in working with DPOs.” Indeed, for the 2015 general elections MILI and the UEC partnered to design 15 pilot accessible polling stations across the country, with the aim to expand these for future elections. Engagement with political parties has also been an important part of MILI’s work. This year, they organized two forums, one in Yangon and one in Mandala, with candidates to educate them about the challenges facing persons with disabilities. MILI has encouraged parties to not only advocate for the rights of persons with disabilities and make inclusive policies part of their platforms, but to nominate candidates with disabilities. 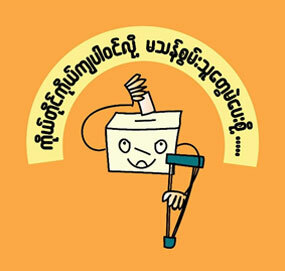 In September and October in the lead up to the vote, MILI developed a how-to-vote guidebook for persons with disabilities, broadcasted voter education programs on Myanmar radio and television, and helped train 220 election officials on accessible polling procedures as part of the UEC’s poll worker cascade training program. MILI and IFES have worked together since 2012, and Soe excitedly asserted, “IFES’ support has been essential. Working with IFES has been a big encouragement for us when working on electoral issues.” Dogged advocates like Soe and the MILI team are ushering in a new and inclusive era for Myanmar and undoubtedly serve as an exemplary model of how to advocate for the rights of persons with disabilities in nascent democracies. Originally published on www.IFES.org on 10 November 2015 and reposted with permission.